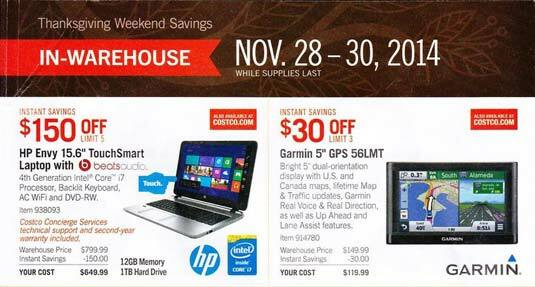 The three day Costco Black Friday 2014 weekend ad scan is now available. Clicking the link above will allow you to view and print the ad scan. The Black Friday deals will not only run on that Friday but also on Saturday and Sunday. Therefore, it starts November 28th and runs through November 30th. There are three total deal sections in this ad scan. The first is the Black Friday ads that are valid in Costco stores. The second is the online only deals, which run from November 27th to December 1st and encompass Thanksgiving, Black Friday, and Cyber Monday. Lastly, there are some additional savings for in-warehouse items from December 1st through December 14th. Don’t forget the Pre-Holiday Savings Event also will be running over that weekend as well. Besides the fact that there isn’t a mad dash to get one of the two TV’s deeply discounted like at Wal-Mart, one exciting thing about Black Friday weekend at Costco is the annual cookbook giveaway. Starting Friday morning everyone who leaves Costco will get a free cookbook. By mid-day Saturday Costco is typically out of them, so it is quite a hot item. Look out for my cookbook giveaway here on the website as well! There are a ton of good deals in the Black Friday 2014 Costco ad. I don’t have time to go over them all, so feel free to put a shoutout to what you like in the comments. The Google Chromecast is a great deal at $10 off, making it only $25 and you get $10 in Google Play credit in addition. The Nikon D3300 DSLR kit for $599 and the Sony A5000 for $449 are also good camera deals. The Blendtec 570 blender for $249 is a good deal if you don’t want to pay the extra needed to get a VitaMix. As for myself, I will likely get the kitchen bags, maybe a throw, and maybe the blu-ray player or the Chromecast. As for the lack of TV deals expect another post with the unadvertised Black Friday TV deals, similar to last year. I think there are two reasons Costco does not advertise them. For one, they want to be able to negotiate with the vendors to get the lowest deals possible up to the last minute, and if they print deals way ahead of time they cannot change pricing. Secondly, they don’t want to have to compete with other stores on Black Friday weekend. They want the customers that know Costco has a good deal and a good warranty and that is enough for them. Leave a comment, let us know what you’re planning on picking up and what you think is a good deal! I’ve been looking for a decent gaming computer and was interested in the online only sales starting on thanksgiving day for one of the listed items. However, nothing indicates what time the sale begins. Midnight, eastern standard time? Do you have any experience or insight that may help?